This application insight looks at Pulsed Fiber Laser marking of plastics focusing on the four key types of mark: foaming, engraving, engraving with colour change and colour change only marking. It also explores Laser marking of different types of plastic including ABS, polyethylene, polypropylene and polycarbonate, and why our Pulsed Fiber Laser is the best tool for the job. Plastic marking of cow ear tags Polyurethane, with an absorber, marked in 6.7s at an average power of 20W and waveform 0 (25kHz). Laser marking is the most flexible way of marking plastics and yields legible, sharp and indelible images. Lasers can mark products with various geometries in a fully computer-controlled process with high reproducibility and reliability. What’s more, Laser marking can be integrated at any point of the assembly line as well as offline (or standalone), resulting in flexibility in marking and logistics. Combined with very low reject rates, this leads to cost reduction in most cases. Marking of plastics with Lasers is accomplished through colour changes and/or surface restructuring. 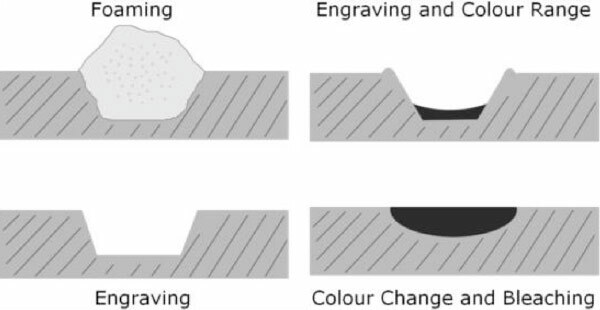 Four different types of mark can be distinguished namely foaming, engraving, engraving with colour change, and colour change only. 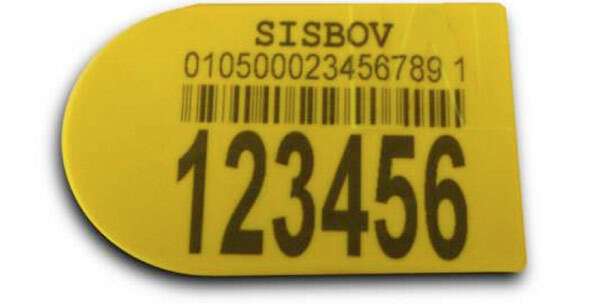 At low Laser intensities on certain polymers Laser marking creates a thin walled foam structure, this appears a lighter colour from the bulk of the polymer. Localised increase in temperatures above the melting point of the material causes melting. Once the material is re-solidified, a modified surface structure occurs in the form of an etch. At relatively high Laser intensities, a local evaporation of surface material causes a trench with ridges. As a result of carbonization, a colour change also occurs. With Laser radiation, of sufficient short wavelength, a dissociation of molecules results in a colour change; this is the most desired effect. Mark contrast can be enhanced using a limited amount of additives. Laser marking can be very quick with some scanner based systems being capable of making marks at speeds in excess of 8m/sec giving the capability to mark over 1,000 alphanumeric characters per second. Due to the high beam quality of the Laser beam marks as narrow as 25µm can be made to an accuracy of just a few microns. Software packages make the programming of these marks relatively simple and offer a range of built in features, such as Laser on/off dwell, to help maximise mark quality and productivity. Marking using ink requires a lot of space in the working area due to the need for a high quantity of ink cartridges. Moreover, the ink used consists of hazardous toxic materials thus making the working environment unsafe. produces contrast by foaming and carbonisation. Lighter colour soften require additives to achieve good contrasts. PC absorbs through the thickness and can produce a subtle carbonisation mark. Good contrast carbonisation marks require higher pulsed energies and power densities than foaming plastics, this particularly applies for ABS. Why use an SPI Laser? Our Laser is a flexible processing Laser that allows highly sensitive process control. It maintains usable pulse repetitions up to 1 MHz far higher than other Laser sources. Our Pulsed Laser has shown a high standard of excellence in the Marking sector due to its stability and ease of control. It can be used to mark a wide variety of plastics, some of which mark far better at these high repetition rates. This is particularly true for foaming type marks. If you would like to have a sample marked with one of our Lasers, please contact a member of our Sales Team (see ‘Contact Us’ page). Marking polymers requires low pulse energy and lower power density than for marking metals. This low pulse energy is available at far higher repetition rates from our Laser(s).